The turbocharger was once such an exotic piece of technology that entire coffee-table books featured the cars that boasted their boost with big “Turbo” badges smeared across every body panel. These were, however, very thin books. That’s because turbos, for the bulk of their fifty-year existence in cars, were expensive, finicky devices that were capable of thrilling drivers but seemingly just as often failed, leaving those same drivers stranded on the side of the road. Boosted engines were volatile, barely controllable appendages that were hard to rouse, initially producing no power at all — and then way more than the driver ever asked for. A turbo, as enthusiasts were promised way back with the first production applications in Corvairs and Oldsmobiles, could produce the power of a big engine with the fuel consumption of a little one. The latter remained an empty promise, and what extra power the turbo made was bad power. It came at the expense of reliability, fuel economy, and drivability, relegating turbocharged engines to the fringes of the market. Yet next year, the vast majority of new BMWs and Audis in U.S. showrooms will be equipped with at least one turbo. Even mainstream makers like Ford are moving toward a fully turbocharged engine lineup in their newest cars. In a few years’ time, the normally aspirated gasoline engine may be almost as rare as the normally aspirated diesel engine. And there exist no normally aspirated diesels. The 2012 Automobile Magazine Technology of the Year happened. That technology, first introduced to the world market by Volkswagen, is the combination of direct gasoline injection, variable valve timing, and turbocharging. You’ll find it on everything from Ford’s forthcoming 1.0-liter three-cylinder engine to the Rolls-Royce Ghost‘s 6.6-liter V-12. It has no official name. VW calls it TSI, but Ford’s EcoBoost badge is the catchiest marketing label so far. We’ve decided to call it the Turbo Tech Trifecta. The components work like a barstool with three legs: remove one leg and you have a pretty lousy stool. 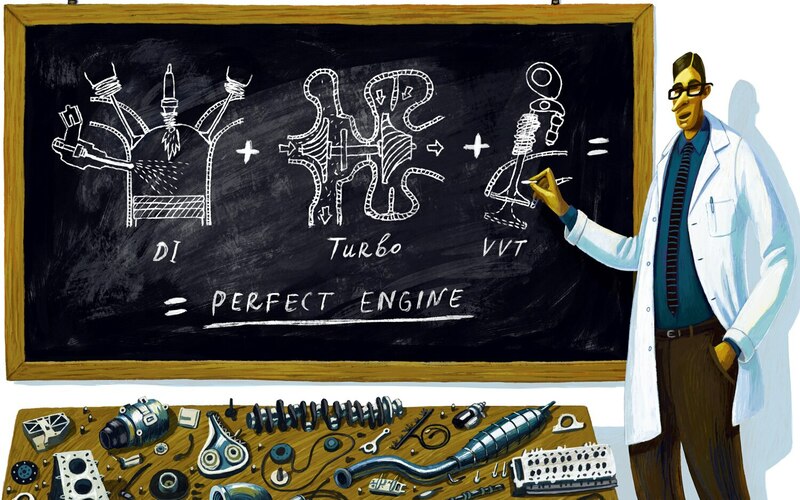 Injecting the fuel directly into the cylinder cools the air and fuel mixture, which means that direct-injected turbo cars don’t have to use excess fuel to avoid detonation. The cooling effect also allows a far higher compression ratio, which translates to less lag, higher efficiency, and more power off-boost. Add variable valve timing and your turbo is no longer effective only in a tiny, remote corner of the engine’s operating range. The computer power required to operate these systems makes even more fun tricks possible, like increasing valve overlap to pump air through the cylinders so the turbo keeps spinning even when there’s no load. Or the computer can inject fuel and light it while the exhaust valve is open, sending a fireball right down the exhaust manifold to quickly spool up the turbo. Everybody loves a good fireball. And everybody loves power. After the 1970s fuel crisis, performance cars were strangled to a pathetic 90 hp and still sucked unleaded like it was going to last forever. Today, fuel economy is rising as our cars keep getting faster and faster. It’s win/win, which is why the Turbo Tech Trifecta is a worthy award winner.